January 26, 2017 By This post may contain affiliate links. Create an entire litter of puppy shaped cookies by using 1 cookie dough recipe and 3 heart shaped cookie cutters. 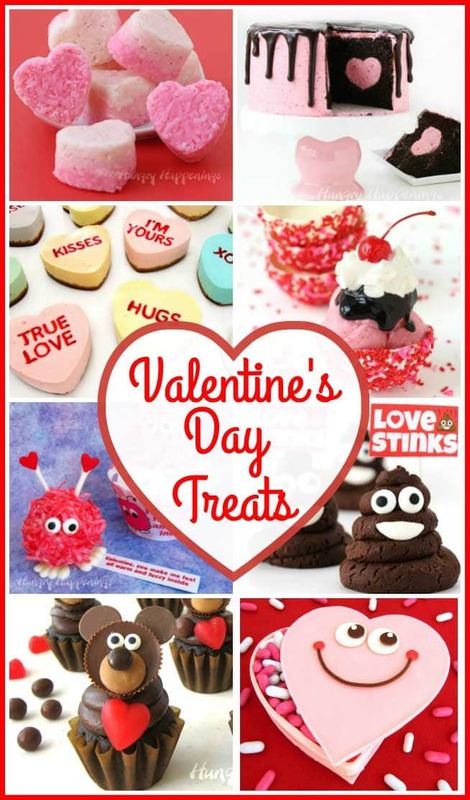 These Puppy Love Cookies will make the cutest treats for Valentine’s Day. 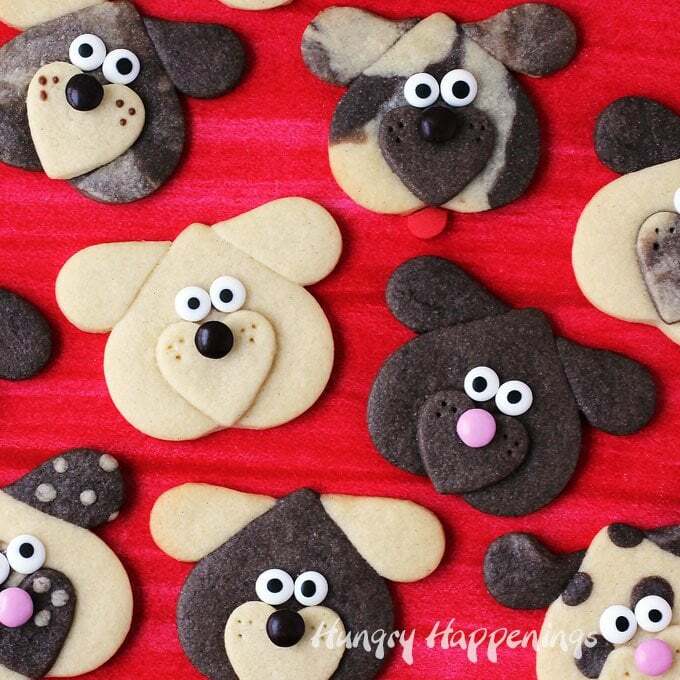 I love dogs so much that I really had fun making these adorable puppy love cookies. Each one has it’s own unique pattern and look to it, but all are equally cute. As I was making them I thought about seeing a litter of puppies being born and watching as each of the dogs came out looking different from the one before. It was so amazing to see that all eight dogs had such different patterns of color on their fur. I got a little crazy and made 30 different designs. Each one of my puppy cookies is unique. Being I created these cookies for Valentine’s Day, I used heart shaped cookie cutters to create the puppy’s head, snout, and even the ears. All of the puppy cookies are made using one simple cookie dough. I divided the dough in half and kept some light in color then added cocoa powder to the other half to make it dark brown. I then got a little crazy by mixing and matching the colored dough, swirling the two colors together, and even making spots to create my 30 different dogs. If you love these cuties as much as I do, head on over to Dixie Crystals website to check out the recipe. 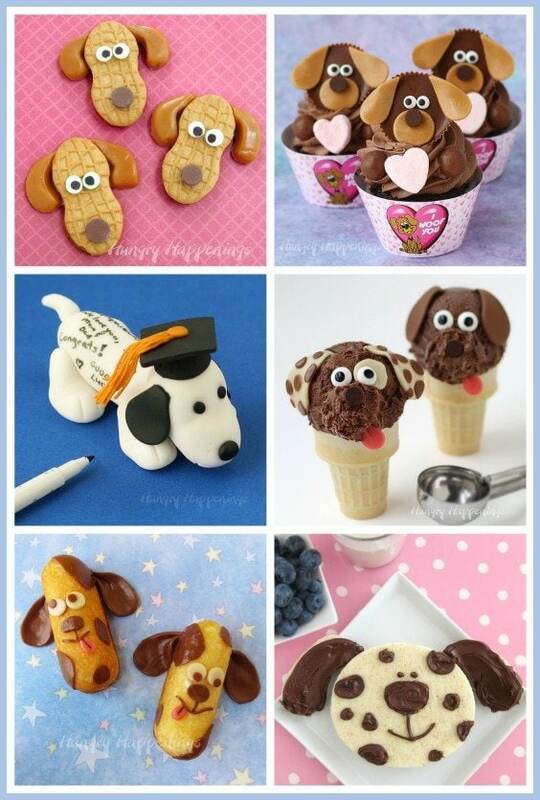 If you love dogs you might also like to make some of these other adorable puppy dog treats. What a great idea! So cute and easy! Thanks, Kim. I had so much fun making all these puppies. Your puppy cookies!!! They are all adorable, but those ones with the tongues I reeeaally <3! I love the tongues too! I’m glad you like them. How many days in advance can I make the cookie dough? I need to make these on a Saturday and need them for both Monday and Thursday. Would you suggest baking the large heart with the ears and muzzle separately then assembling them on Wednesday? or do you think if I packaged each one separately after decorating on Saturday they would be OK? I have 48 cupcake to make on Sunday. You can make the dough up to 4 days in advance if you want to keep the dough refrigerated or up to 2 months in advance if you want to store the dough in the freezer. I freeze dough all the time so I have it on hand when I need it. The cookies will stay fresh for up to a week once baked if they are stored in an airtight container. A metal cookie tin works the best but a plastic airtight container will work as well. If you package the cookies in individual bags then place those in an airtight container they may stay fresh even longer. So you could definitely bake and assemble the cookies a few days in advance. You can even bake them then freeze them if you really want to ensure they taste fresh. Package them in an airtight container or even a freezer zip top bag and they will stay fresh for up to a few months if frozen. Have fun making your cookies and cupcakes!